Stock status is current as of 4/19/2019 2:44 AMET. 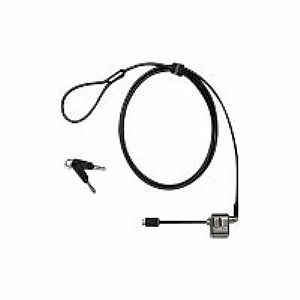 The Kensington MiniSaver cable lock from Lenovo allows customers to obtain physical security of their tablets, Ultrabooks, laptops, phones, desktops, monitors, docks or other compatible devices in all public areas such as the offices, schools or while traveling. Cable locks are the first line of defense help reduce theft, and increase physical asset security protection. The push button design offers one hand operation for easy installation while Kensington's patented technology secures the lock to your device. Superior strength lock head to resist tampering. Key to unlock. Protection against hardware and data theft. High level of security . Supports new tablets and hardware and is backwards compatible with all systems with a lock slot. Smallest attach point in the industry that reduces surface area required for locking and unobtrusive to other ports. Design for ease-of-use and aesthetics. Support existing keying technology and methods.